Please refer to the Attendance Policies for the First 100 Weeks and Second 100 Weeks. A link to the absence reporting form can be found on the Attendance Policies page or the forms page. When/ How do I receive my bills? Information about billing, deadlines, and disbursement can be found on the Zucker School of Medicine website under the Office of Student Finance. How long will the Commencement ceremony be? Where is it located? The commencement ceremony will last about two hours and it will take place at the John Cranford Adams Playhouse (south campus, Hofstra University). There will be a reception following the ceremony at the Zucker School of Medicine. All graduates, guests of graduates, faculty, staff and guests are invited. Only ticketed guests will be permitted to enter the ceremony. We suggest that students, guests, faculty and staff parking in the Zucker School of Medicine parking lots and surrounding lots (parking lots adjacent to the soccer field, north of the medical school). All of these lots are on the north side of campus. There will be a shuttle running from the Zucker School of Medicine front entrance to the ceremony site on South Campus from 12:00 PM – 2PM and immediately after the ceremony. Will there be a livestream of the ceremony? Yes, there will be a livestream of the Zucker School of Medicine Commencement Ceremony available on the commencement webpage and shared on our Facebook page. I have family members attending who asked about hotel recommendations. Is there a discount at any hotel nearby? Yes, there is a discount offered at the Long Island Marriott (right near the medical school) for family & friends of a graduate. I want to attend Commencement. Do I need to order attire? How do I RSVP? I am a faculty member attending Commencement. Is there anything I need to do? Where should I RSVP? Where do I go the day of the ceremony? Faculty can RSVP for commencement AND order academic attire using the same survey. Please keep an eye out for your invitation being sent via email or email medicine.students@hofstra.edu to obtain an RSVP/Attire Order survey. Faculty members who wish to participate in the ceremony must be in academic attire to process in and sit in the faculty section. Faculty should report to the Roosevelt Quad on South Campus no later than 1:30PM on Commencement Day to receive academic attire and line up to process in. If a faculty member would like to attend the ceremony and sit elsewhere, please email medicine.students@hofstra.edu for a ticket to commencement. I am a faculty member and I have my own academic attire. Do I need to RSVP? Yes, you can still RSVP using the link on the invite and indicate that you own your attire. How do I obtain funding to attend a conference through the school? The Office of Student Affairs has a Conference Funding and Attendance Guideline. The Office of Student Affairs offers up to $1,500 for MD candidates that meet the requirements stated in the policy, and other funds for PhD candidates. Please fill out the form noted in the policy to be considered for this funding. Applications are reviewed and approved on a weekly basis. I’m a current student leader and would like to host a conference at the school. Who should I speak to? When planning for a conference, it’s important to consider a few logistical details. In addition, students must obtain prior approval before submitting a bid for any conference. Please schedule an appointment with the Office of Student Affairs and review these points prior to see if your organization is eligible. I’m a student leader. Where can I find the Event Form? Current student leaders should visit the Event Management page on the Student Council website to start planning their event. Where can I find a list of student forms (such as an LOA form)? Links to updated versions of most student forms can be found by visiting the Student Forms page on the Current Students section of the Zucker School of Medicine website. Where can I schedule an appointment for health clearance or a flu shot? How do I schedule an appointment with EHS? To schedule an appointment for your annual compliance, follow up, or receive a flu shot, please call Employee Health Services (EHS) at (718) 470-5350. Please identify that you are a current medical student and bring identification with you to all appointments. To request a copy of your medical records, please email EHS@northwell.edu and copy medicine.students@hofstra.edu. I received my influenza vaccination at a site other than Employee Health Services. How do I go about letting them know? To submit proof of influenza vaccination or declination, email EHSflucompliance@northwell.edu and copy medicine.students@hofstra.edu. A flu badge can be obtained by visiting the Office of Student Affairs after submitting documentation. I need to have my PPD (TB) test read. Where can I do this & what do I do when I’m done? PPD readings can be done during annual health compliance visits, at Hofstra’s Wellness Center (with an appointment), at Employee Health Services (with an appointment) or by any clinician who has been trained. We suggest that whomever attests to this documentation be a practicing clinician and not be a Zucker School of Medicine faculty member to avoid conflicts of interest. Is there a list of recommended physicians? The Office of Student Affairs links to a list of recommended physicians for both physicians and mental health services each week at the bottom of our weekly email under “Student Support Services.” Please contact the Office of Student Affairs if you cannot locate our last email. How do I get a new Zucker School of Medicine (Hofstra ID) card? Current students who have lost their Hofstra ID should obtain a new card by visiting Card Services in the Hofstra Student Center. There is a fee for lost ID cards and students will need their license to obtain a new one. Current students are expected to have their Zucker School of Medicine ID cards on them at all times. I turn 26 in a few weeks and am losing access to my current health insurance plan. Can I be added to the Zucker School of Medicine health insurance plan? In order to be added to the Zucker School of Medicine plan, fill out this form three weeks prior to the start date of your new insurance plan. When your enrollment is confirmed, the Office of Student Affairs will notify you via Pride email, send instructions to log into your insurance portal, and confirm billing. Insurance invoices will be adding to Zucker School of Medicine bills alongside tuitions and fees. What do I need to do to become enrolled in the Zucker School of Medicine health insurance plan? In order to be added to the Zucker School of Medicine plan, please fill out this form three weeks prior to the start date of your new insurance plan. When your plan becomes effective, the Office of Student Affairs will notify you and send a bill for payments. Where can I find my health insurance card? All students enrolled through the Zucker School of Medicine health insurance can log onto their health insurance portal to view or print a copy of their health insurance card. How do I log into my health insurance portal? Instructions to log onto the Zucker School of Medicine health insurance portal can be found by emailing medicine.students@hofstra.edu. My health insurance carrier is requesting a letter stating that I am a full-time student. Where can I go to request this? To request a letter of enrollment, please visit the Student Records website. Please note that these requests normally take about 72 hours. For additional assistance, please contact somregistrar@hofstra.edu. I would like to remove myself from the School’s health insurance plan. How do I go about doing this? Please email medicine.students@hofstra.edu stating that you would like to be removed from the Zucker School of Medicine health insurance plan and include the exact date of termination, a copy of the front and back of new insurance cards, and new insurance policy summary of coverage. Does the School Health Insurance include dental or eye insurance or fitness plan? No, unfortunately it does not include eye insurance or dental insurance. However, there are plan enhancements available to add on eye and dental coverage. EyeMed (Discount Vision), Basix (Dental Savings), and CampusFit (Fitness program). Students can log onto their insurance portal for additional information. How should I note the school’s health insurance on EHS forms? Please put “Zucker School of Medicine Health Insurance” or provide the carrier and group name from your health insurance card. I’m an accepted/deposited student. What do I need to do prior to my arrival? Congratulations! We’re excited to welcome you to the Zucker School of Medicine community. Please log on to your myHofstra portal to view the pre-matriculation requirements (released in March and updated through July). These items may include but are not limited to orientation dates, registration authorization, health requirements, insurance requirements, housing and more. The Office of Student Affairs will also send correspondence to your personal email and your Hofstra Pride email to notify you of upcoming deadlines. Please note that all financial aid forms, health forms, or other personally identifiable information should be sent using the instructions provided on your portal. These documents must be uploaded through a secure data collection platform. If you have any questions about this information, please contact us by calling (516) 463-7347 or emailing medicine.students@hofstra.edu. I am currently enrolled in another institution and plan to finish my degree after I have started medical school. Is this something that I can do? The Zucker School of Medicine does not allow students to matriculate while maintaining active matriculation in another degree granting institution. If you are currently enrolled in a degree granting program, we suggest that you defer completion until the summer between your first and second years of medical school or confirm program completion prior to your arrival. During those free months, you are free to matriculate as a student in another institution and complete it by the time your second year starts. If you have additional concerns, please reach out to our office. My transcript will arrive later than the anticipated due date. What should I do? The Office of Student Affairs requires that students send a completed transcript prior to their matriculation. We understand that some institutions may require several weeks to process this information and suggest you request this early. Digital versions can be sent directly to somregistrar@hofstra.edu. If you think the transcript will not be sent in on time, please email somregistrar@hofstra.edu to let us know. Do I have to complete my health clearance (EHS) forms prior to my arrival? Yes, even if you plan on completing your pre-matriculation health requirements with a personal care physician, your forms need to be filled out and submitted. Please fill these out by the due date and send them to the email listed on the form. Please put “Zucker School of Medicine Health Insurance” or provide the carrier and group name if it is available to you. Do I need to include my New York address on the EHS forms? No, you can leave this blank or put your home address and update it upon your arrival. I’m an incoming student and currently on my parent’s/spouse’s health insurance plan. Can I remain on this plan? There are several health insurance plan requirements that a personal plan must meet in order to be accepted. These requirements are listed on your myHofstra portal under the pre-matriculation health requirements. If your personal plan meets these, please follow the instructions on your portal to submit a copy of the front and back of your personal health insurance card and your plan description. What textbooks do I need to start? What supplies do I need to start? Is there any pre-work for me to do? Please log onto your myHofstra portal and review the information in the Pre-Work Requirements (posted in July), including a letter from the Office of Curriculum Support, a textbook list and supply list. I am not sure what size to put down for my EMS Uniform/Scrubs. Can you offer some guidance? The scrubs are your own personal pair to use in our Structure lab. The scrub sizes are unisex and tend to run large. The temperature in the Structure Lab is normally cold and you are permitted to wear layers underneath your scrubs. Please take this into account when ordering sizes. EMT uniforms are unisex. EMT shirts are a short sleeve, button down shirt and will have to be tucked into your pants during the shift. EMT pants sit high at your natural waist. Please refer to the EMT forms for references. The Office of Student Affairs has provided several resources (listed on your myHofstra portal) to find available living spaces off campus. In addition, your class Facebook page is a place where roommates have found each other prior to matriculation. The Office of Student Affairs can provide general guidance about the rental process on Long Island. The Office of Student Finance is available to discuss budgeting and what works for your personal financial situation. I am looking for additional information on Hofstra’s insurance plan and don’t see any listed. When will this be available and what do I need to do to sign up? Additional information on Hofstra’s insurance plan will be released over the summer when Hofstra University confirms its contract with the insurance carrier. We anticipate this information will be available around July 1st. If you have already decided to enroll in our plan, please fill out this form. Please put your NY address if available; if not, we will ask you to update this after you arrive. I am a linkage student and have not taken my MCATs yet. Should I still submit my forms? Yes, we are aware that your MCAT scores are still pending but would like to collect your information. Please submit your pre-matriculation information (listed on your myHofstra portal) on time. In addition, we suggest that you delay larger expenses, such as supplies, textbooks and laptop purchases until your enrollment is confirmed. Am I required to have a car or personal vehicle for medical school? Do I need a license? Students travel between different site locations as part of the educational experience as soon as the first year of medical school. Please review the transportation policy found here. Hofstra University offers campus shuttles and ZipCars. Shuttle schedules and train information can be found here. Students are required to have a valid driver’s license. You will be asked to upload this information on your portal. Where do I pick up my Northwell ID? Will I have parking privileges at Northwell Health sites? Your Northwell ID will be distributed by the Office of Student Affairs upon matriculation. Students will receive access to park in the employee parking lots at certain Northwell sites. I lost my Northwell ID. Where can I get a new one? Current students can visit the Northwell Security Office at 1991 Marcus Ave, Suite 301 in Lake Success to get a new ID. Hours are 9AM - 3PM. Please call beforehand (516) 472-6034 to make an appointment and let them know you are a current medical student. Please bring your medical student ID, a letter of enrollment, and a driver’s license with you to the appointment. How do I access the Northwell Virtual Portal? Virtual Portal access is granted for students participating in summer research or at the beginning of your third year. If you are a current student participating in summer research, please email medicine.students@hofstra.edu. If you are beginning your thrid year and need help with access please email SOMACE@hofstra.edu. Do we have Northwell email access? As you begin your MS3 year, you will receive access to several security and IT components of Northwell Health, including a Northwell email address. Please note that this email access cannot be forwarded to any email due to security restrictions. How do I go about changing my name in the Hofstra/Northwell systems? In order to change your name with both Hofstra University and Northwell, please visit the Student Records website and fill out the appropriate form. Unfortunately, at this point, neither Hofstra University or Northwell will be able to change your email addresses. Display names on your ID badges and portals will be updated to reflect your new name in both institutions. Please plan to obtain a new Northwell ID badge and update the Office of Student Affairs with your scrubs. Please allow 5-7 business days for these changes to take place. Are there funds available for students to print posters for conferences/Scholarship Day? The Office of Student Affairs will print posters for approved student conferences at no cost to the student. Please email a final version of your poster in PDF format to medicine.students@hofstra.edu two weeks prior to the date needed. How can I request a letter of enrollment, good standing, or one for jury duty stating that I’m a full-time student? Please visit the Student Records website and fill out the appropriate form. 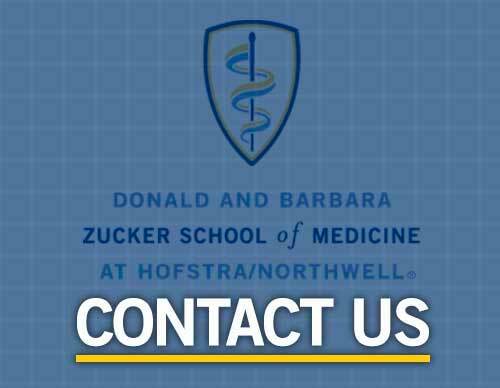 Email the Zucker School of Medicine Registrar (somregistrar@hofstra.edu) for any questions or concerns. Please note that these requests normally take about 72 hours. Who can help complete my registration forms for USMLE Step 1? Instructions for USMLE Step 1 registration can be found on the Student Records website. Who can help complete my registration forms for USMLE Step 2? Instructions for USMLE Step 2 registration can be found on the Student Records website. I would like to purchase an extra/replace my white coat. How do I go about getting a new one? If you would like to order a new or additional white coat, please email medicine.students@hofstra.edu with your white coat size and if you would prefer a male or female coat. Additional coats cost $30.00. Orders can be paid for in cash or personal check, made out to Hofstra University. Orders take approximately 3 weeks to be delivered.